As a reporter, you can be asked to cover both the mundane and the truly magical. Often, you don’t get to choose what becomes news. Going with the flow becomes the norm. It’s the type of place where some kids drive BMWs, sport iPhone 5’s as a token accessory, and jet off to St. Lucia for a relaxing spring break. Meanwhile, others proudly wear John Deere baseball caps, take vocational classes centered around agricultural practices, and grew up on sweet tea, dirt biking through the woods, and NASCAR. In short, my alma mater is a mixing ground for the Old South and New South. The one with all the transplants from Michigan, New York, Pennsylvania and Ohio, that is. Sure, there’s a huge push to take AP classes, become digitally savvy and get into the state’s leading public universities. There’s also an award-winning soccer team, an amazing drama department that’s traveled to Edinburgh’s Fringe Festival to perform, and astounding murals swirling along the white walls. Naturally, there’s a clique for jocks, band kids, preppies and goths. Students huddle in their groups before the first morning bell sounds, and it’s unthinkable to wander far outside your bubble. Fitting in somewhere is crucial and so is experimentation. God forbid your friends and classmates think you’re not up to speed on the latest sexual practice, social media phenomenon, or way to smuggle alcohol into parties. The funny thing about listening to this town hall meeting was that my perspective was radically different as a working young adult than it had been as a high school kid. At 16 or 17, I probably would have been nodding along fervently with the adults who said using any drug or drinking was akin to a moral failure and surprisingly – since we were in a public venue – a sin. Most people on the panel were religious and spoke about involving teens in church youth groups to keep them on the straight and narrow. To my ears, it all sounded a little extreme and ridiculous. I felt very caught between two worlds. On one side was the shiny-shoed police man with the crew cut and firm voice speaking fact, sense, reason. On the other lingered every whispered rumor in the hallways, every late night gathering with friends, every party I’d been to and every less-than-pristine choice I’d seen myself and others make. It wasn’t so easy to be black-and-white now knowing life was filled with gray. It’s not that I’m advocating for drug use. On the contrary, I’ve never smoked anything, including cigarettes. And, it’s likely that the moment I become a mother, I’ll be all about my child hanging out with the church-going, over-achievers from the involved, loving families. But, as I see it now, there’s something alluring about the entering your teenage and young adult years. There’s a feeling that with every passing birthday, new possibilities are opening up for you to experience, try on, and see if they fit. From driving to voting to drinking, growing up is a step-by-step process. Trying to stamp out every guy with shaggy hair and killer eyes who heads to the sports field after class with his buddies to smoke pot is about as likely as eliminating hazing at college frat houses. Life’s going to happen to these kids, and they need to be prepared to deal with it. It’s absolutely ok to choose to say no to every single substance. For your health, it’s certainly preferable as every doctor will tell you. From afar, the flannel-wearing, indie-music listening, secret house-party attending kids seem pretty cutting edge. Some of them are fabulous people with blazing futures ahead. Others are masking up a lot of childhood pain, personal suffering or feelings of inadequacy. But you won’t know until you get up close and find out. Off with your . . . finger? Sometime in middle school, the rich and never-ending world of European history entered my awareness. I loved the idea of structured, English society with its thatched-roof villages and market squares. I could easily visualize dark gray castles surrounded by woods and rippling fields of wheat. Of course, the world I constructed in my mind probably looked a lot more like the setting of Alfred Tennyson’s poem “The Lady of Shalott” than it did an actual representation of reality, but that was beside the point. King Henry VIII’s sixteenth-century court cast a particular spell over me, and to this day, I find the man and his many wives intriguing. Aside from being a hot-headed ruler, marrying six times, and fathering three future heads of state, Henry is most famous for creating The Church of England when the Catholic Pope Clement VII refused to grant his first annulment from Catherine of Aragon. 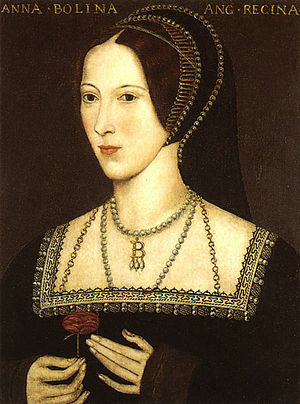 The woman whom he wished to marry instead, Anne Boleyn, has gone down in history as some sort of dark-haired enchantress. She did spend ample time in the French court, and thus it was said she knew how to manipulate Henry, promising to bear him his first son if only she could become queen.While she did give birth to Queen Elizabeth I—but alas had no sons—and successfully wore the crown for three short years, Anne’s life ended abruptly when she was beheaded at Henry’s command for committing adultery, a charge that many historians believe to be false. As she spent her final days locked in The Tower of London, whispers spread through the kingdom that she possessed a sixth finger on her right hand, the mark of a witch. These rumors were helped along by Nicholas Sanders’ writings in 1586, half a century after her death. Yet when, as a young teenager, I had the great privilege to receive an insider’s tour of the London Parliament from a friend of the family who worked there, I was shocked to hear this woman point to an ornate portrait of Anne Boleyn as we walked along a hallway and mention her remarkably long sleeves, which were meant to hide this extra finger. While I have no idea if Anne suffered from such an abnormality or not, the discovery of another finger fragment has created much upheaval in the science world over the last few years. In 2008 a roughly 40,000-year-old fossilized pinky bone fragment was found in Denisova Cave in southern Siberia and is said to have belonged to a young girl. What intrigued scientists most was that the bone fragment belonged neither to a human nor to a Neanderthal. More strangely still, the DNA from the finger seemed unusually similar to the DNA of those who currently inhabit the Pacific Islands. Christened a “Denisovan” remain, the girl’s finger found its way to a research lab where its DNA underwent genetic sequencing technology by an international team of researchers. They found that Denisovans shared a common origin with Neanderthals but were genetically different from them, meaning that they descended from the same ancient population of Neanderthals who themselves had taken a different evolutionary route from the ancestors of modern humans even earlier in archeological history. Svante Pääbo of the Max Planck Institute for Evolutionary Anthropology in Leipzig, Germany, along with many others, was shocked to learn that this new group had DNA that matched about 5 percent of the genome of the modern Oceania population, suggesting that interbreeding took place between Denisovans and modern humans. It had already been discovered that Neanderthals interbred with the ancestors of all modern-day, non-African populations. Thus, instead of modern humans slowly migrating out of Africa thousands of years ago and out-competing Neanderthals for food and shelter, it seems like our evolutionary past will be portrayed as a more complex mural on museum walls in the future. It now appears that a group of our ancestors left Africa somewhere between 300,000 and 400,000 years ago, with one branch evolving into Neanderthals and migrating to Europe while the other headed East and developed into Denisovans. When an anatomically modern group of humans left Africa about 70,000 years ago, they came across Neanderthals and interbred so that roughly 2.5 percent of the genome of all non-Africans is made up of Neanderthal DNA. Later, one last band of modern humans found the Denisovans and mated with them also. Peter Parham, an immunologist at the Standford University School of Medicine, believes as few as six couplings between humans, Neanderthals, and Denisovans could have led to the current genetic diversity we now see. Since the latter groups lived in Europe and Asia for so many thousands of years before modern humans arrived on the scene, they evolved ways to fight certain diseases. When modern humans mated with them, they also received a dose of helpful DNA for their immune systems. So powerful and beneficial that it remains with us to this day. On the other hand, this archaic immune material might also be responsible for autoimmune diseases like diabetes, arthritis, and multiple sclerosis. Although, much like Anne Boleyn, the Neanderthals and Denisovans met their demise, literal parts of them live on in us, shaping us into a hybrid species. Clearly, mating partners matter. And to think, all these stories started with a finger . . .
Life: Just a spin of the rainbow dial?